Can China broaden its network of close allies from the current line-up of “problem” states (North Korea, Iran) to some of its neighbors? It’s hard to see how if Beijing also feels compelled to get tougher with its neighbors over disputes such as in the South China Sea. The obvious way for Beijing to win some friends would be to either submit to an international ruling or even abandon any pretensions to the nine-dash line that’s at the center of so much criticism. This sounds unlikely, but the latter route was suggested by one of our panelists last week at Harvard University as one of the best ways for China to improve its international standing. He’s right – the territory at stake around the Paracel and Spratlys is more strategically important to Southeast Asian nations like Vietnam and the Philippines. But Mu Chunshan, one of our China-based writers, had some interesting observations yesterday on one of the reasons why this is so unlikely. The fact is that China’s policy makers appear to be caught between a rock and a hard place – its public is increasingly aware of the dubious company the country keeps diplomatically, but at the same time, many seem to want a much tougher response to territorial disputes. This was evident in the ongoing standoff between the Philippines and China last week. 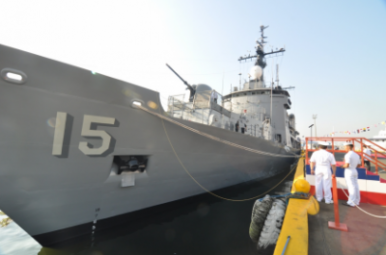 According to reports, a Philippine Navy surveillance plane spotted several Chinese fishing vessels in a lagoon at Scarborough, prompting the Philippines to deploy its largest warship, the BRP Gregorio del Pilar. Filipino sailors from the warship apparently boarded the Chinese vessels for an inspection and discovered large amounts of illegally collected corals, giant clams and live sharks inside the first boat. Two Chinese maritime surveillance ships later reportedly positioned themselves in between the Gregorio del Pilar and the Chinese fishing vessels, preventing the arrests of the fishermen. And news today suggests that the standoff risks escalating further, with Beijing dispatching a powerful military vessel to the disputed area. “According to Chinese media reports Thursday, officials say the country’s most advanced fishing patrol vessel, the Yuzheng 310, has been sent to protect Chinese fishermen in the region,” VOA News notes. The Philippines has requested that the issue be referred to an international court. Perfectly reasonable sounding, but it’s a request that has been rejected outright by China. This is no surprise – China has consistently rejected outside “interference.” But it’s yet another opportunity missed by Beijing to take the high road. China’s Not-So-Hard Power StrategyChina’s Small Stick DiplomacyWhy Philippines Stands Up to ChinaPivot Out, Rebalance InChina’s Next Flashpoint?